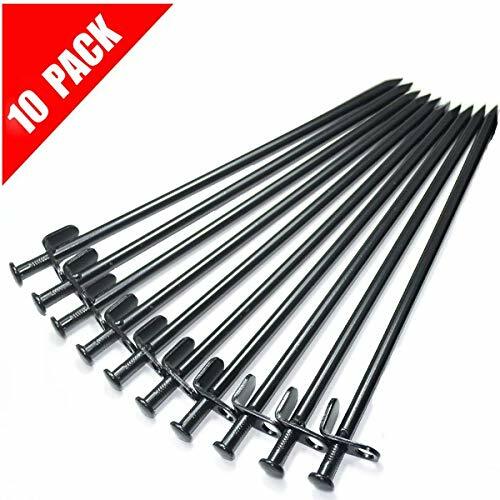 FIT HARD OR ROCKY GROUND - High tensile steel construction makes these tent stakes easy to penetrate the roughest terrain. PERFECT LENGTH - 11.8" each, Easy on backpack but long enough to keep your tent secure. And we offer a 600D Oxford Fabric Pouch while supplies lasts. OPTIMIZED DESIGN - Convenient to pull out the tent stakes through the hook or hole of stakes with tent hammer. MULTI USE - Tent stakes are suitable for nailing tents, canopies, tarps, and etc. to the ground. Perfect for outdoors camping and backpacking. Long and large tent stakes make sure your camping trip safe in the tents.